While I enjoy a good bun while eating a burger, really, who needs them? Especially when you swap them out for meat patties. 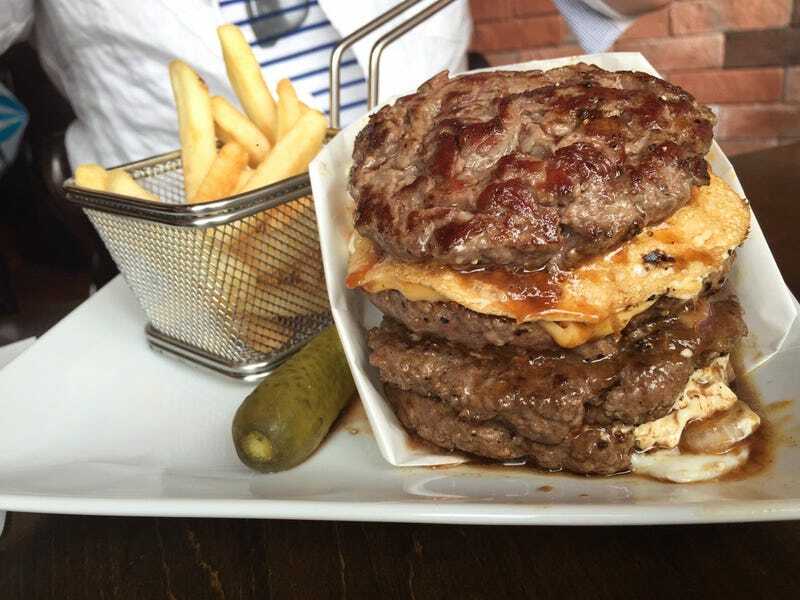 This is the “Wild Out” burger. It’s two juicy beef patties, cheese, fixings, and a big slice of tomato. Served up at a Tokyo restaurant called Shake Tree, the staff ask you not to eat it with a knife and fork, but like a regular burger. Bless them. The Wild Out is 1,450 yen (US$12.34) If you so dare, you can order extra meat for your meat burger, like in the top photo. Extra meat and extra toppings are, well, extra. Goodness, this looks delicious. Everyone seems to be agreeing—or adding that it does taste terrific. Via Gigazine, here’s a look at how tender the meat looks. One thing to know about Shake Tree: Since they are using prime meat for their burgers, they only set aside a certain amount they can make each day. So, once they’ve sold out, that’s it until tomorrow.